You spend hours a day on your feet so you’ve decided to invest in some high quality work boots. You’ve bought a pair of Red Wing Shoes in Richmond Va at one of our three convenient locations. While you were at the store the salesman brought up insoles for your new boots but you didn’t get them. So why should you go back and get insoles for your Red Wings? Your feet aren’t the same as somebody else’s, which means that pair of Red Wing work boots you just bought won’t fit you the same as somebody else. Maybe you don’t get the same arch support as somebody else, or maybe there’s just not enough cushioning for your tastes. That’s where the insoles come in. 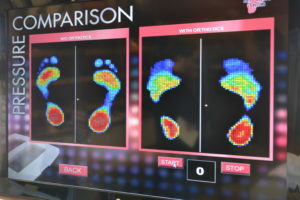 At Red Wing Shoes Richmond we have this great device that lets us really see your feet. We see where the points of pressure are, how your balance is distributed between your feet, and what type of arch you have (or don’t have). From that we’re able to pick insoles that will make your Red Wing work boots the most comfortable pair of shoes you’ve ever owned because they’re picked based on your feet to give you maximum comfort. You went with Red Wing Shoes because you wanted the best quality work boots, now let us customize them to your feet with insoles from Red Wing that feature the same great quality you expect from us. If you have any questions, be sure to get in touch! You can contact us online or give us a ring. If you’re ready to pick up some of our comfortable insoles, visit one of our three Red Wing Richmond location! Let us take your already great boots and make them even better with comfort inserts picked just for the needs of your feet.